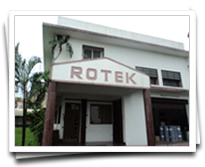 * Rotek Industries is not associated with any other company in India or any where in the World. Rotek is a full line supplier of flexible packaging materials and pouches. To be truly successful in the world market, a project of this kind requires competence, endurance and perception. The visionaries who founded Rotek had all, as well as experience of many decades in the art of packaging and printing. Since 1978 the proprietor is in Manufacturing of Flexible Packaging Material & Pouches in New Delhi, Later he shifted to Goa in 2000 & started Rotek with his well experienced team. Today Rotek has arrived as a rising star in the critical packaging horizon. It is posed to become a benchmark, representing the state-of-the-art in flexible packaging technology and packaging materials. Since its inception, the company has witnessed a manifold increase in its production level and product range. Rotek has steadily earned a dependable name in India and abroad due to its policy of enhanced market sensitivity. We have our booths at # 3- F 71Medica , Düsseldorf, Germany and AACC, USA from last almost one Decade. Rotek is successfully catering to the packaging requirements of various large and small companies / corporations, MNC’s and are dedicated to help our clients pack their product attractively and cost effectively. Using state-of-the-art technology and trained operators, we have been able to achieve the best results for our clients at the minimum of costs. The quality of our product speaks for itself as our product is manufactured on the belief that the primary role of good packaging is to preserve the product. Rotek Manufactures All type of Aluminium foil Pouches and Laminates rolls which are regularly in export direct to USA, ARGENTINA, BRAZIL, MEXICO, CHILE, COLOMBIA, CANADA, UK, GERMANY, FRANCE, ITALY, HUNGARY, ROMANIA, BELGIUM, SPAIN, AUSTRIA, HUNGARY, SWITZERLAND, FINLAND, GREECE, IRELAND, POLAND, DENMARK, THE NETHERLANDS, TURKEY, SOUTH AFRICA, MALAYSIA, SAUDI ARABIA, IRAN, ISRAEL, JORDAN, NIGERIA, UGANDA, DUBAI, CHINA, LAOS, etc and otherwise it is in use almost all over the WORLD. Rotek Industries exhibits their range of products as an exhibitor at Medica – Düsseldorf, Germany and AACC – USA from last almost one decade.